Do you believe Augustine or Calvin? Do you believe in full immersion baptism, or sprinkle baptism? Do you think bread and wine symbolize taking in the Spirit of Jesus, or do you think you actually embody the body and blood of Jesus when you participate in Holy Communion? 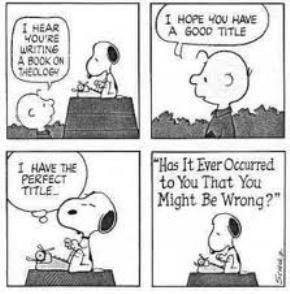 Do you believe the Bible is infallible and inerrant, or do you believe there are different genres in the Bible and it is to be read differently depending upon the particular book? Do you believe God created the world in an actual, 24-hour seven days, or do you believe God’s days are on a completely different time frame than ours? Do you believe in predestination, or that we have full choice about inviting Jesus into our lives? Do you believe we have to continually earn our salvation and if we turn our backs on God He will turn His back on us, or do you believe in a loving God who always loves, is slow to anger, and will never abandon us? Do you believe the faithful will be rescued and taken “up” to heaven when Christ returns, or do you believe heaven will be here on earth and God will walk among us, never closing the door to anyone? Do you believe somewhere in between all of the above, or does it matter? You see, once we stop arguing about all of those differences, once we stop dividing ourselves over all the theological dogma, we can begin to focus on the really important stuff. The important stuff is Jesus. The important stuff is what He said, what He repeated over and over again. What He asked of us, what He instructed us, what He commanded us, what He did for us. Do you think you’re in a never ending battle to please God, to work for your salvation or you’ll end up in the fires of hell? Please don’t believe it. Christ already redeemed you, healed you, offered you the free gift of grace and brought you into an unconditionally loving relationship with the Father. He gave you His Spirit, who lives inside you. Do you think if you do something wrong the Spirit will leave you? The Father will stop loving you? Jesus will stop interceding for you? Love always comes first. It’s never about looking for sin and determining punishment or worrying about earning a place in heaven. Amen… And what a refreshing post! We have to get back to the heart of it.. The greatest commandment is to love God with all our heart, soul, mind and strength! The world around us needs Jesus… Not differing views and arguing saints. “the heart of it.” Exactly, Brittany. Oh, we have to remember that, don’t we. That’s exactly what it is! We have a book that tells us what we need to know and do. That book is the New Testament. It is our human manual. All we have to do is read, reflect, meditate, pray, and look for the answers to come by inspiration based on what Christ said. Simple. So simple that few people apparently heed it, preferring the idolatry of endless ‘belief’ systems to which they attribute Christianity. I find very few people emulating Christ, least of all, most Christians I know. Amen, Beth. Those red letter words say it all. Love. Thanks as always for your contribution. So nice to know you share this. I’m one of the first who wants the arguing to stop between those who preach or teach about the Good News gospel. I say if it’s in the bible, we take it in context as written. Don’t go adding or subtracting anything from the words of God. And don’t add any man-scented doctrine…God needs no help in telling us what He wants! Absolutely my point, Steve. “In context” is the key. Checking several sources is key. And keeping an open mind and heart so the Spirit can continue to work in you also key. That will preach sister. Here let me error your brow. Love it Susan amen. 😀 Thanks, Tom. Love to you, too. Amen and amen. Love. Jesus. Love others. That’s what I believe.